There are many people out there who have been given the birthdate placed in the very special month of December. For some, they relish in the notion of being surrounded by seasonal festivities of lights, trees and wreaths and believe this only accentuates the happiness of celebrating a birthday. For others, there’s quite a different story… For those who lie on the latter side of the fence, you may feel cheated by the idea of having to share a day which was supposed to be dedicated to you and only you with heavy hitters such as Christmas or Hanukkah getting in the way. 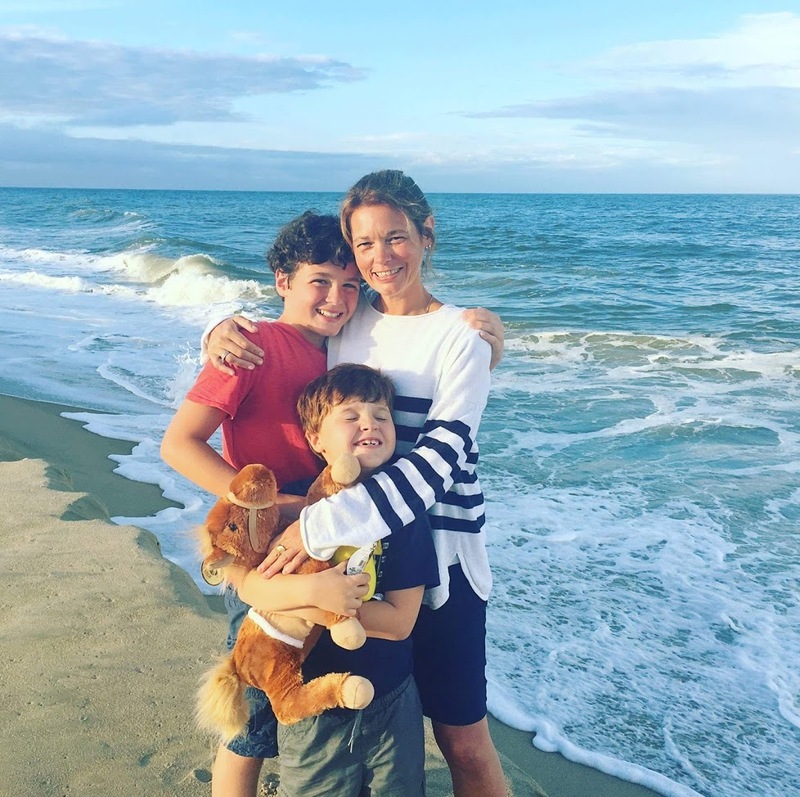 Have you ever perceived your birthday as being seemingly less important and perhaps experienced with less enthusiasm due to the busyness of the season? What about the terrible gift labeled, “For Your Birthday AND Christmas” that’s supposed to be perfectly acceptable as a combined present for both? Face it- you’ve probably felt robbed at one point or another and can sympathize with new babies born on December 28th. In my family, we actually have a triple header in this department with three birthdays all falling just before and after Christmas. My husband, who observes the earliest of the trio on December 4th, constantly grudges about his youthful disappointments of having his day meshed with other yuletide fetes and reminds us annually of the importance of throwing a proper ceremony dedicated solely to a birthdate. The second to place is my youngest falling on December 11th who relishes knowing the holiday tradition of putting up the tree will always happen on his birthday. Last but not least is my oldest son who even though had the due date of December 25th, didn’t officially arrive until two days later on the 27th. He doesn’t seem to mind in the slightest bit of his post-holiday remembrance and instead chooses to use the celebration of the season to his advantage. After all, it is the happiest time of the year and who wouldn’t look forward to and encore of presents? I suppose we’re all different (what do I know? I was born on April 5th) but wouldn’t it be nice to be given a few pointers on what these December babies feel is appropriate birthday etiquette? For starters, presents should never be wrapped in Christmas paper because they feel that the wasted effort is an insult to their occasion. Secondly (as I mentioned before) don’t even try to sneak past a gift (no matter how large or expensive) that is said to be meant for both a birthday and a holiday. In their world, this is absolutely sacrilegious. A third tip is to never bake them a Santa or menorah cake accept in the situation where the request has been made. Although there typically tends to be tons of sweets and treats around this time of year that you could quickly pass off, most December partygoers really wants a typical cake. The last piece of advice you should be wary of in case you are planning to gift flowers is nixing poinsettia plants or red/white arrangements for floral birthday gestures. Stick to bright colors that are reflective of the celebration and wait to give these “Christmasy” displays of blooms until after their special day. Everyone wants to feel special on their birthday so make sure to put in the effort by sticking to this guide if you have a loved one celebrating a birthday this December. 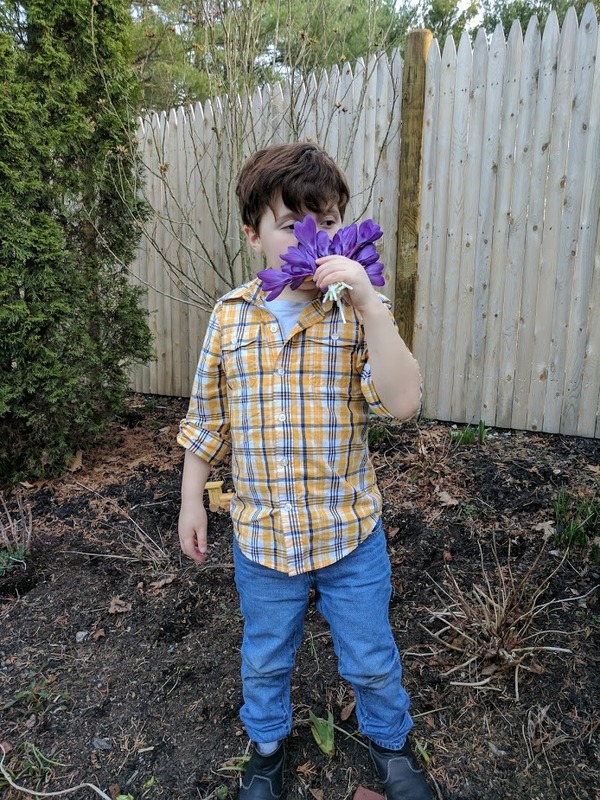 I’m a mom of two boys and also a big lover of plants and flowers so the question is, “How do I combine them both?” It’s a stereotype that boys don’t belong around the frilly stuff and should instead be committed solely to the “manly” rough and tumbling activities associated with the outdoors. Flower designing may as well be stricken right off the list as something the male species should be attracted to and to put it simply… That’s just isn’t right. Although admittedly, times are getting better in terms of it being socially acceptable to wipe clean the lines drawn for “girl hobbies” vs. “boy hobbies”, I still find this particular stereotype a frustrating issue to bend. Even though girls have been thankfully increasing the ratios as athletes found within hockey, football and baseball- the male species seems to be having a more difficult time adapting to activities, which have previously been seen as “chic stuff”. As you can imagine, flower arranging is right up on the top of the tier and I for one feel this is a shame. Is there a way to attract more boys to the floral world? I believe there is. One way of encouraging a healthy connection to plants and flowers is to partake in hikes where wildflowers are prevalent, visiting preservation areas where plant life is abundant and reading about horticulture together. 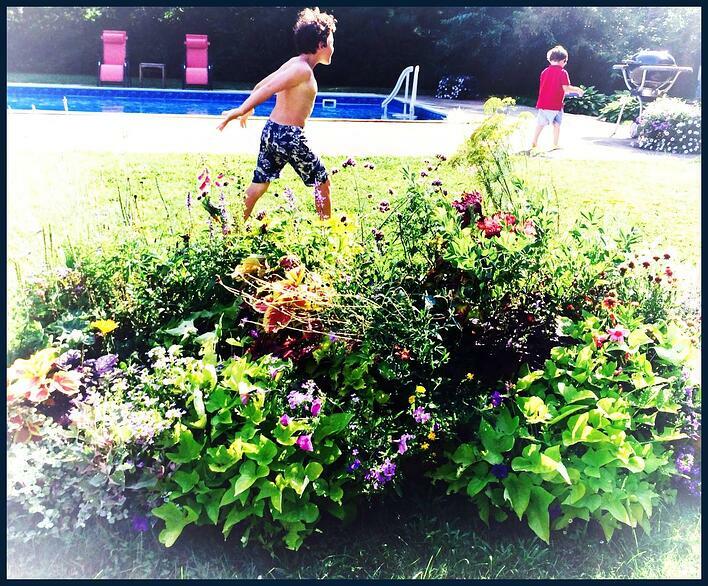 By exposing boys to the beauty of flowers, we can stimulate growth that reaches far beyond what we could ever imagine. Did you know that males who possess a connection to both plants and flowers have a greater likelihood to become compassionate, giving and understanding? Did you also know that boys who have an early education about horticulture possess stronger skills within creative thinking, planning and organization? Really, it’s true! Others believe that it may also advance early development of coping skills as well as fuel a longer and happier life in general. Now these should be reasons enough alone why we should be fostering this important connection to flowers! So how should we go about it? Try these simple ways to support a lasting relationship, which might stimulate positive outcomes throughout a boy’s entire life. 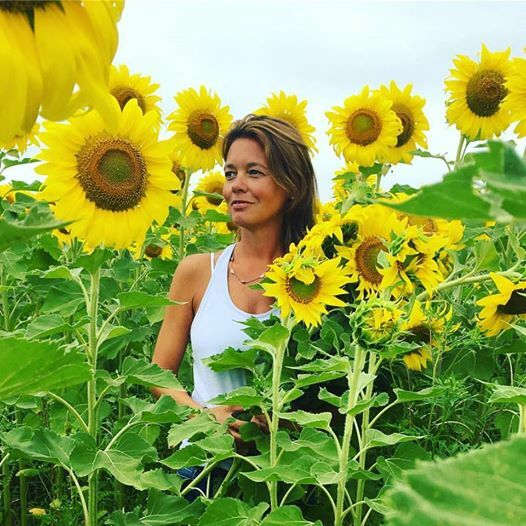 I’ve always had a sweet spot for sunflowers in the summertime and clearly I’m not alone judging from the beautiful pictures I always see while scrolling down social media feeds. Maybe it’s their happy faces or maybe it’s their colorful warm glow of yellow that triggers pleasant thoughts from onlookers. For me, a sunflower’s simple elegance as it towers above all other flowers growing from the earth is what has kept this bloom my one my seasonal favorites. The funny thing about sunflowers is that although they can be easily grown by seeds in a variety of different soil conditions, they are commonly threatened by wildlife such as chipmunks, rabbits and worst of all, woodchucks! I have my own battles brewing in the yard against pests that bend the sunflowers stems until it snaps, allowing them easy access to the plant’s leaves. Yes, you can attempt to stake the stalks but even that’s no sure fire way to ward of those horrible rodents from ruining your gardening efforts. This year, I decided that I would try to out-seed the demand by growing three times the amount of sunflowers that I have in the past. Right now, I have around ten sunflowers out of thirty looking hopeful but you never know when their number is up when it comes to critters. After all, they have to eat too, right? So the better answer to enjoying these stunning summer blossom is to locate farms that professionally grow them, allowing you to not only view the sunflower fields but to also take a few stems home for yourself! Typically, these are called flower-cutting farms where you bring or borrow a pair of clippers, tote a bucket and clip from their crops cultivated especially for this activity. Make sure you ask what their rules are before cutting since many of these operations take the care of their harvest very seriously and what to ensure a long season of beauty for all. 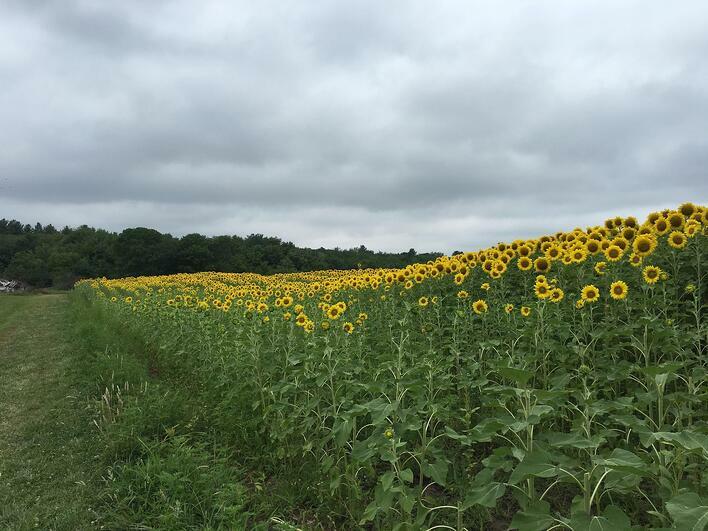 Interestingly, there are many places that offer this fun and memorable chance to clip sunflowers and here are a few that I’ve found to be wonderful so far! Our favorite blogger Suzie Canale takes us for a walk through her garden in Westwood. While being outside in the garden is great exercise and makes you feel better, the harvest from your vegetable garden makes it all worthwhile. Get an uo close look at healthy and energizing broccoli and cauliflower plants in the garden. 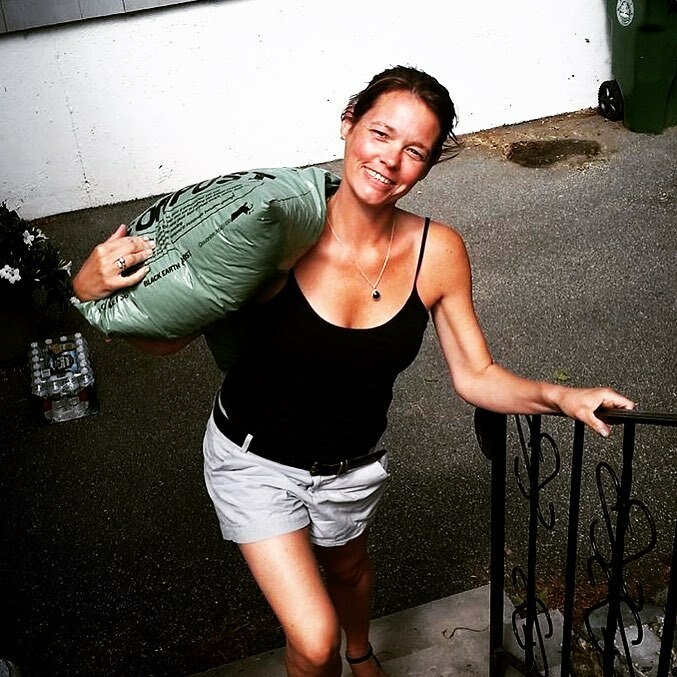 Our favorite blogger, Suzie Canale is an avid gardener. 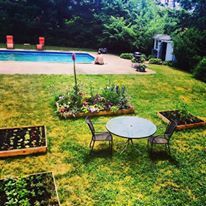 At her home in Westwood, Massachusetts Suzie has many raised beds featuring perennials, annuals, herbs and vegetables. She even has her own greenhouse. 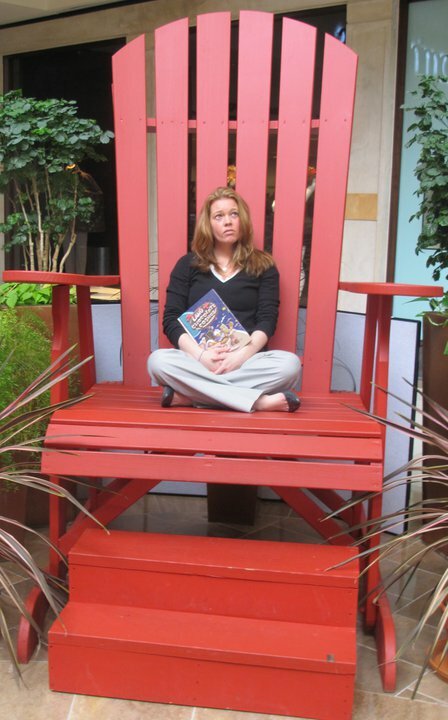 Suzie's blog posts often feature garden tips appropriate for experts and beginners. Take a walk with her in this garden video. We’ve been busy pulling weeds, cleaning the beds, adding soil, clearing debris, rebuilding framework, watering, feeding and planting our flower gardens this month anticipating the warmer days that will soon arrive! Pretty soon we’ll be able to watch our efforts flourish under the blue skies of summer, hopefully enjoying the stunning floral display around our houses and within our backyards. Did you know that landscaping property with perennials and annuals actually increase the value of your home? How about the fact that gardening can also foster otherwise threatened animal and inset species (such as bees) to repopulate, therefore benefiting our environment? Gardening is becoming one of the top most beneficial acts deemed by the Environmental Protection Agency to be the fastest effective medicine against the damaging agents of pollution. According to other similar organizations, this hobby is also a major supporter for necessary recycling, while it counters effects issues of plant and wildlife endangerment and even exorbitant energy costs. Just by spending thirty minutes in the outdoors planting seeds for flowers and vegetables, we can help decrease harmful issues concerning our earth by over 35%! 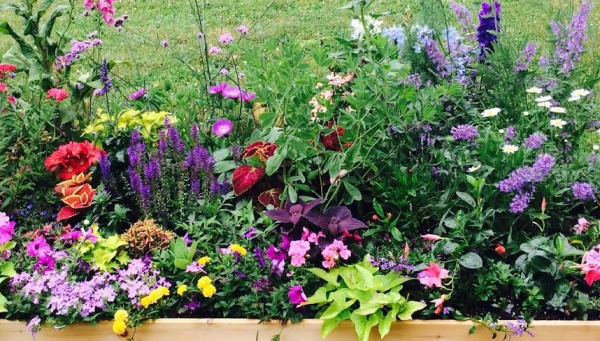 Being deemed one of the most affordable hobbies for typical US families, local agencies are asking those who can to help out and plant a garden this summer. It only takes a bit of soil, seeds, water, sunshine and a little love and care to make a difference in your community so why not get started today! Growing your own food is a great way to increase the heath of your family by consuming a tasty and heavy dose of vitamins from non-processed veggies and fruits. Growing-Your-Own saves a hefty piece of your grocery budget during the months of June, July, August and even September. Gardening is exercise-so don’t let anyone tell you differently! You don’t always realize the bending, pulling and pushing movements you make which burns hundreds of calories. Spending time in the outdoors raises levels of endorphins that chemically affect the brain in a positive manner. You’ll see your outlook improve as well as your overall state in general mood. It can be a social thing to! Start chatting up your neighbors about what their favorite plants and flowers are and where the best places are to buy them! You’ll make fast friends and develop a whole new social group of people who share the same love of gardening as you do. 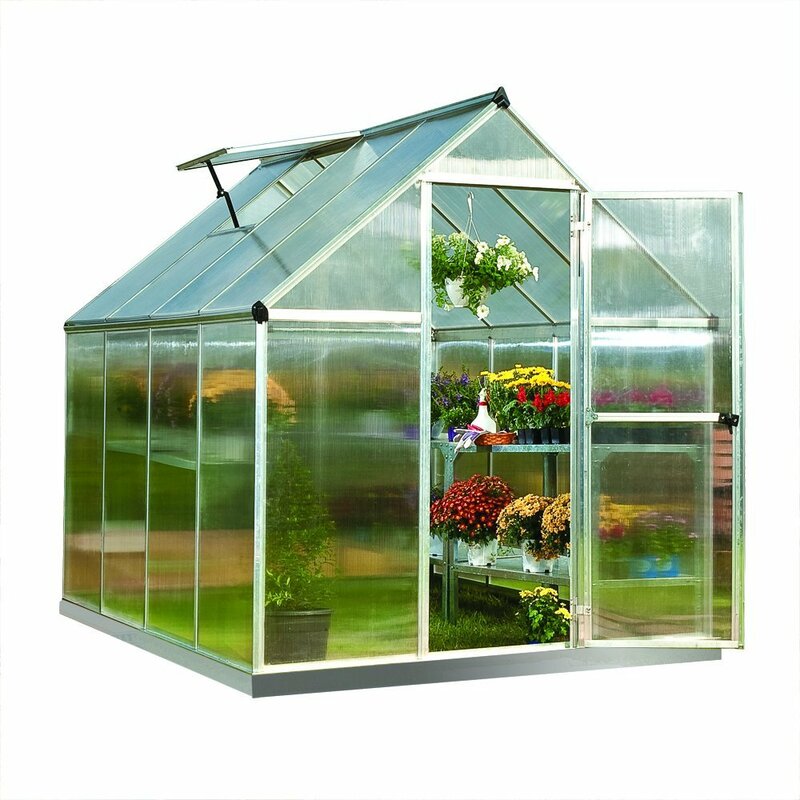 Backyard greenhouses are an interesting topic of discussion for those diehard garden lovers like me, specifically regarding the issue on whether purchasing their own is worth the investment. Years ago, to own one of these dream set-ups cost tens of thousands of dollars but times have changed. With technological advances within manufacturing, greenhouses are beginning to pop up in residential areas making the idea more plausible than it used to be in the past. Don’t get me wrong, they aren’t by any means cheap but they are at least attainable without putting your house up for mortgage. 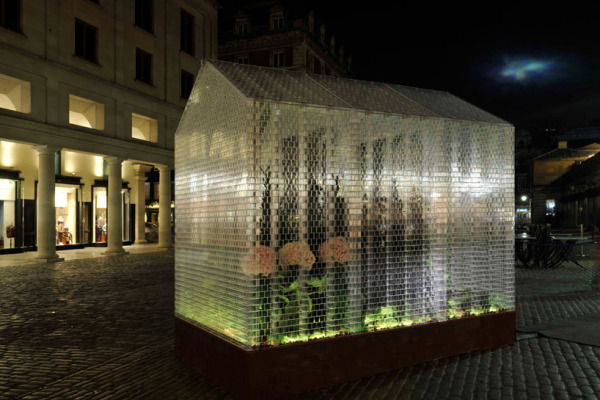 this awesome greenhouse is made of legos. What has made this possible? Well, for starters, the materials used to build them have fluctuated to include more options than using solely glass. With the introduction of heavy-duty plastics, tarps and Plexiglas, the costs to purchase and ship have dramatically decreased. 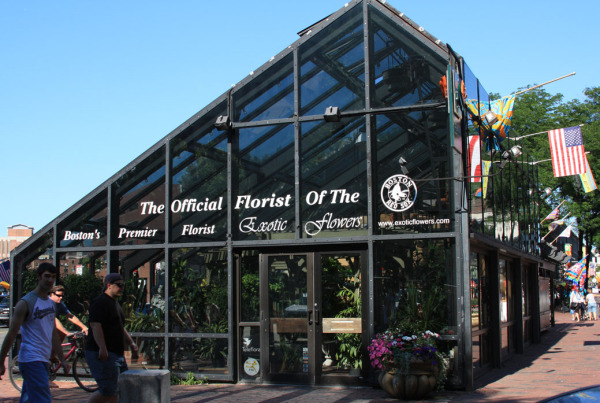 Sizing has also been altered, offering customers greenhouses that are small walk-ins to more substantial exteriors. Another factor that must be considered is the actual act of putting one of these suckers together, which used to be impossible without a team of engineers at your disposal. Nowadays, instructions are not only clearer (while most include round the clock call in or email support) but the time constraints have lessened due to the convenience of click and lock beams that avoid troublesome bolts, nuts and screws. The model that I just put up a few days ago even had a number printed on every piece so that I could easily follow along with the pictures featured in the manual. It’s a beautiful thing that anyone who wants to get a jump start on the growing season now has several options available to them without fearing that the construction will be impossible. It’s not. If you’re in the market to buy your very own greenhouse, take a look at the benefits of doing so plus a list of retailers (the list is growing) who are ready to ship today! Libraries are amazing places and serve their communities far beyond the task of lending books. Most local libraries also provide informative classes and workshops for both children and adults to enhance their knowledge and education throughout many different topics. There are science programs, writing workshops and impressive guest lecturers including top authors from the area who offer stimulating presentations throughout the year. While all are open to the public, these sessions are provided for the sole purpose of connecting members of the community and growing comparable interests that will foster both new ideas and relationships. Plus- almost everything offered is free of charge, allowing anyone with a library card to join in. 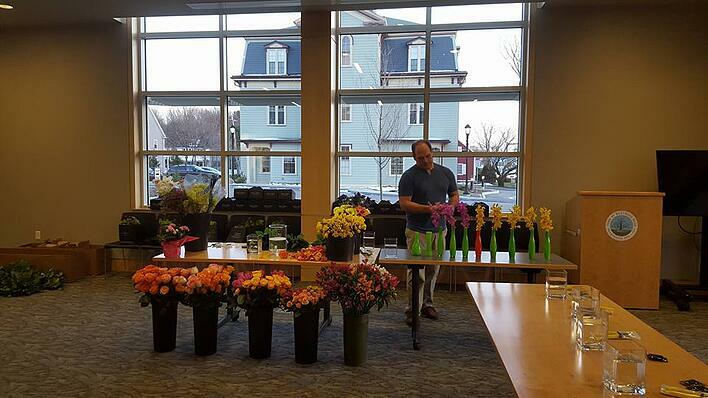 On Tuesday, March 22nd I was fortunate to assist my husband with an impressive floral demonstration to the patrons of the Westwood Public Library. 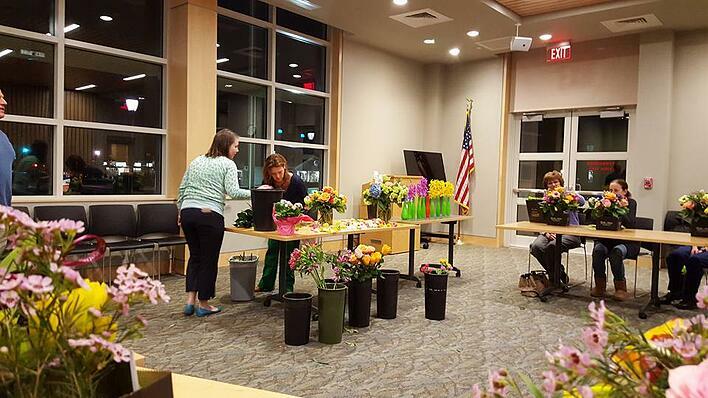 During the two-hour program, guests were given their own vases, supplies and flowers to learn the easy and fun way to arrange their own centerpieces. Along with teaching proper technique and form, Rick Canale led an interesting talk about the do’s and don’ts of handling the blooms as well as giving a brief background of the flowers he was using. 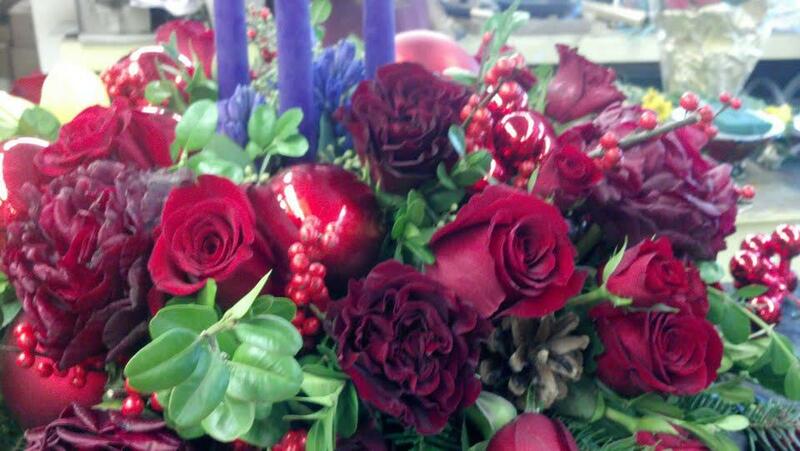 Varieties included stunning garden roses, spray roses, alstroemeria, anemones and lemon leaf for the finishing foliage. The vases were rectangular, heavy glass, which provided a sturdy base for the product and a cardboard box for easy carry home was also available. In the end, the room couldn’t have smelled better with the luscious spring color bursting from every table. We had a great time during this adult flower arranging class and hope to return with a fresh new look designing in the future! The New England Book Festival is held annually in Boston to recognize exceptional writing from both local and global talent. Genres include poetry, fiction, non-fiction, children’s picture books, “how-to”, photography/art, wild card (anything goes), business, spiritual, young adult, gay, compilations/ anthologies, cookbooks and unpublished manuscripts. Authors from around New England submit their work to be judged by a panel to compete for an award that consists of honorable mentions, runner-ups, winners or the overall grand prizewinner. On December 31st, 2015, the list was revealed to see who would be receiving a plaque as well as an invitation for the special ceremony set to take place at the Omni Parker House sometime during the end of January. After scrolling down the list of titles and authors, we were pleasantly surprised to find our guest blogger, Suzie Canale included as the winner of the unpublished manuscript category! 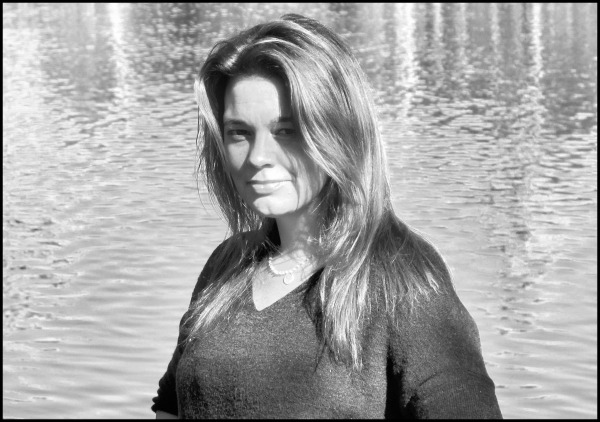 Her title, “Camp Everdeen: Boys Will Be Boys”, is her latest work that was written for YA (Young Adult) readers, specifically in grades 3 to 5. Although the story remains unpublished at this time, Suzie is hopeful that the book may spark interest now that it’s grabbing some industry attention. 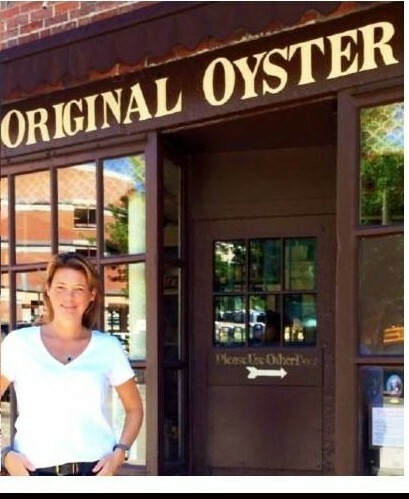 Although it is her first attempt at writing outside of the children’s picture book genre, she says, “It won’t be the last…” The author who has won over a dozen awards in the last five years is already planning a sequel to the book where she derives ideas from her own past’s teenage goof-ups and drama. 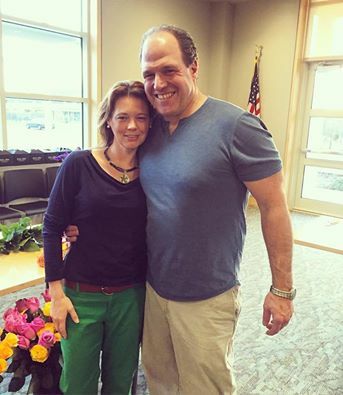 The location of the story is also based on her real life experiences attending Jim Loscutoff’s “Camp Evergreen” located in Andover, Massachusetts. If you would like a sneak peak at the plot, check out this brief synopsis, which will leave you wanting to read more! Madeline Souza is excited to start her first year as a real Junior CIT at her favorite summer home away from home, Camp Everdeen and can’t wait to be reunited with her two best friends, Jamie and Laura. Although she starts out believing that this will be the best eight weeks of her life, she soon finds disappointment when she’s put in charge of the worst cabin of boys on campus and paired with her arch nemesis, Jeff Larson. As if the noise, mess and stink of caring for ten little monsters wasn’t bad enough, Laura’s crush on the tennis assistant, Sam Holden, gets sticky when a new beauty queen counselor enters the picture. Madeline, Laura and Jamie won’t take matters lying down and decide to devise their own plans to revenge the boys of Camp Everdeen. As we inch closer and closer to the spookiest time of year, New Englanders are beginning to get in the mood for scary costumes, carved pumpkins and other fun entities that tie in with the theme of October. For me, I love twisting my creative writing around stories that revolve around mystery and mayhem, a pretty big change from my genre of children’s fantasy poetry. As a native Bostonian, I particularly enjoy developing storylines that use the stunning picturesque images that are synonymous with autumn in New England. If you’re a mystery book reader, you’ll know what I’m getting at because there’s no shortage of these titles. Why is it that the industry doesn’t become over saturated with “who done it’s” based on this area? The reason is because they’re rich with colorful detail and authentic spooky charm! We are invested more when we read something that connects us to a story having relatable aspects such as background, characters or familiar settings. Just take a look at Stephen King who has successfully seduced his fans by cleverly by incorporating many distinguishing features of Maine within his thrillers. New England is a place full of mysterious potential and possesses a long history of fascinating folklore, some true and some made up. Plots can be manufactured from actual facts or completely concocted from our imaginations. Recently, I’ve written two short stories that are based on people, places and things that are identifiable with the cultural aspects of New England. Take a peek if you’re looking for a little fright this season! Beth has just lost her job as a Manhattan columnist and has no choice but to return to the home of her grandmother, Lily, where she spent her summers as a child. Becoming re-accustomed to the pace of the quaint New England town proves difficult at first until an ancient puzzle piece is found in her room. Scripted in Latin with the word “Letum” meaning death, the plot thickens when an intruder breaks into the mansion, assaulting Lily and leaving behind another peculiar clue. 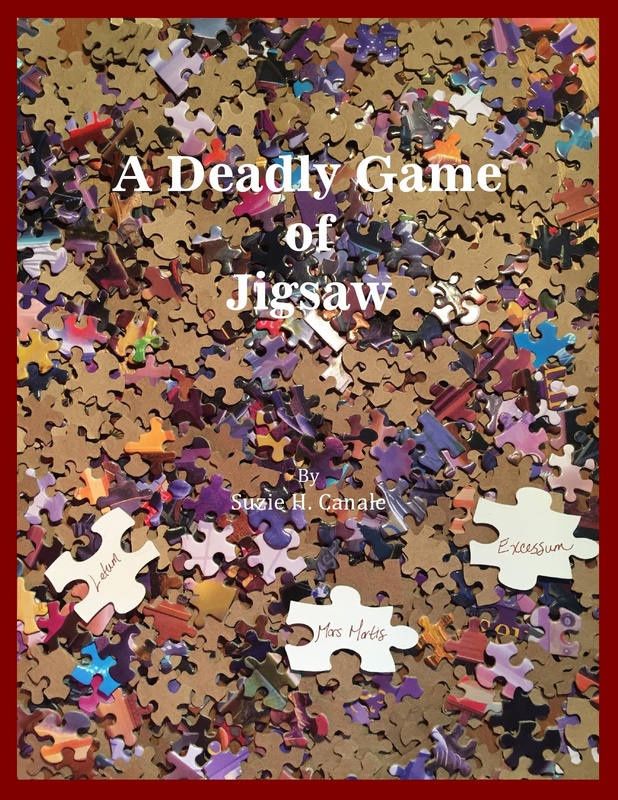 With time running out, the women begin their hunt to track down the person behind the mystery and be the first to win at the deadly game of jigsaw. 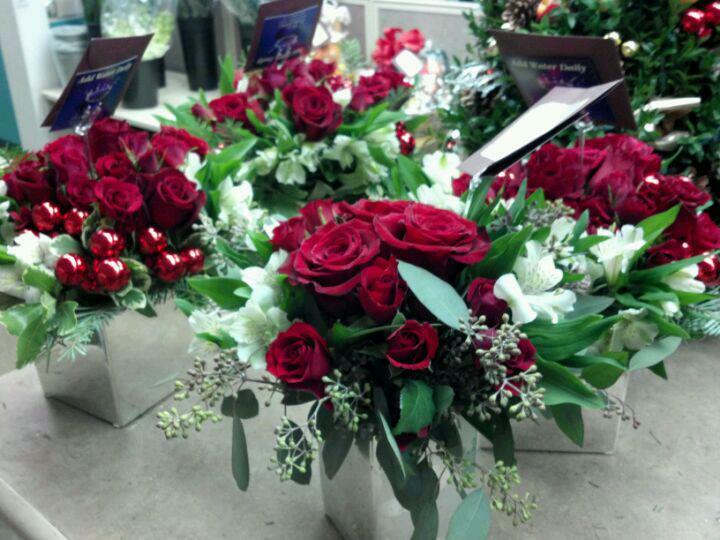 It’s Valentine’s Day once again in the city of Boston and florists are gearing up for a busy holiday that is until the owner of Delicately Yours Flower Shop, Reuben Crench, is found dead in the ice chest. As the case unravels, the victim is discovered to have ingested a large amount of digitalis, ironically traced to his own shipment of flowers. Detective Mike Hinkley has his work cut out for him with a long list of suspects including disgruntled employees, a competing local floral business, an angry wholesaler and a cheating husband. Will he be able to find the killer in time to save Valentine’s Day?